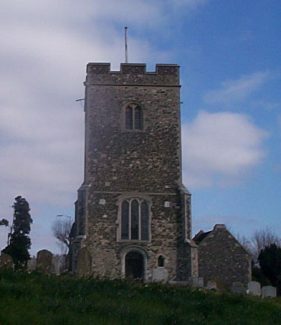 There was a church in Chadwell before the Norman conquest, although the earliest parts of the current church are early Norman. The chancel was built in the 14th century and is at a slight angle to the nave. The tower dates from the early 16th century. The south porch was built at the end of the 19th century. On the south wall, there is scratch dial which served as a crude sun dial when a stick was placed in the hole. This was used to help ensure mass was said at the correct time. There is a cherubic figure on the north-west corner of the tower. There may originally have been one at each corner since a similar figure was found in the churchyard and is now on display at the Thurrock museum. 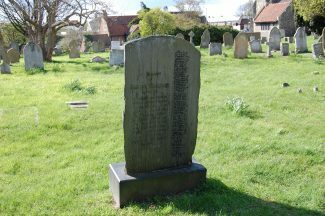 In the churchyard on the north side of the church, there is a war memorial. Among the graves in the south side of the churchyard is a memorial (in Japanese and English) to Kadzuo Yamazaki who died on July 13 1899 in a fire on board the SS Kawachi Maru, while she was in Tilbury docks. There is another stone with Japanese writing in the north-east corner of the churchyard. I was in the church choir, with my brother Charlie, 1946-49 see my article on The Open Air School, the war memorial stands close to the North boundry wall, which we choirboys helped to rebuild. i have just bought a black and white postcard of this church.